If you know me, you know I am a tad-bit obsessed with skin care. As someone who rarely wears make-up and when I do it is super minimalist and 'natural', I heavily rely on my face naturally glowing and looking food. I have researched and self taught myself what my healthy skin should look like. And the most important lesson I have learned it that what shows up on our face is a reflection of our habits and overall health. 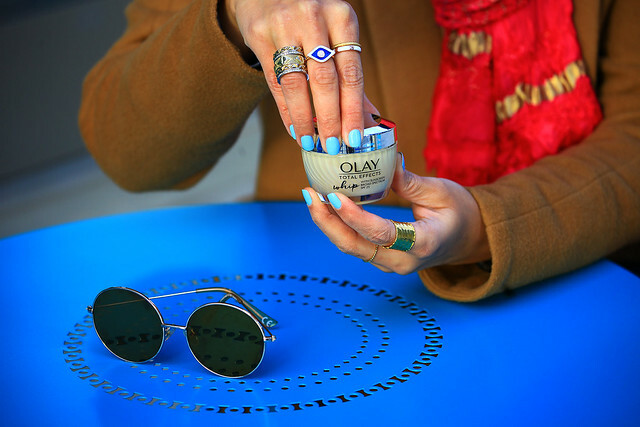 In today's post I am sharing how Olay Total Effects Whip Face Moisturizer and some lifestyle changes one can make to ensure a healthy skin for all seasons. Knowing your skin type is the first step in a healthy skin care regimen. By selecting products that appropriate to your skin type you are giving your skin the nutrition it needs to normalize. If you don’t get this right, nothing else matters. Dry skin should be treated differently than oily skin, which should be treated differently than combination or sensitive skin. Every conversation with a beauty adviser should begin with your skin type. When you’re dehydrated your skin is more likely to show age. There isn't exactly one recommended dosage of water for everyone, as a lot of this depends on factors such as body composition and levels of exertion, but a general guideline is to drink 7 to 10 oz of water every 10 to 20 minutes. Drinking lots of water is a good start, but you also have to use a good moisturizer. Even in the summer, and even if your skin tends to be oily, you need to hydrate your skin and then lock the moisture in. Not only will your skin feel better, it will look younger and healthier. One of my favorite skin care brand is Olay. 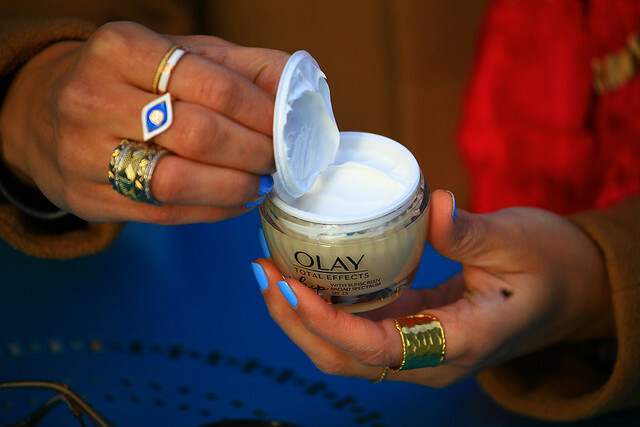 Their new Olay Total Effects Whip Face Moisturizer is the Ultimate Nourishment Without Weight. You can expect 7 Skin Benefits in One - It actively replenishes nourishing moisture, evens skin tone appearance (which is one of my top skin issues), enhances brightness, visibly smooths fine lines and wrinkles, minimizes the look of pores, restores firmness and visibly reduces dark spots. Formulated with VitaNiacin Complex II and Vitamins C & E this moisturizer helps fight the early signs of aging. One of the reasons I am really loving Olay Total Effects Whip Face Moisturizer is that despite the vast array of lightweight-claiming moisturizer choices offered today, women are regularly forced to choose between a product that provides powerful results, but feels sticky + tacky; and one that feels truly lightweight, but doesn’t offer much beyond basic hydration. This is the void that Olay Total Effects Whip Face Moisturizer fills in. A balanced diet that emphasizes leafy greens, vegetables, fresh fruit and healthy fats will help feed your skin from inside. These foods are rich in antioxidants and long chain fatty acids that will nourish your skin and help protect it from aging. Consistent intake of antioxidant help protect the skin from looking tired and worn, and keeps aging at bay. We all know exercising is good for the heart, and helps manage your weight, but exercise will also help your skin look better. The increased blood flow improves radiance and help firm your skin, while working up a good sweat will help release toxins. If you look in the mirror and see dull, drained, or problem skin, check your sleeping habits. When you don’t get enough sleep, your skin suffers and you’re more likely to experience puffy eyes and dryness. Improve your sleep and incorporate less stress and more relaxation into your day so that you glow from the inside out. When we are at rest our skin is better able to repair itself and regenerate. Sleep is connected to great skin! Younger, healthier looking skin isn’t difficult to achieve, but it does take discipline. With just a bit of care and consideration your skin will look its best all year round. I shopped for Olay Total Effects Whip Face Moisturizer at my local Harris Teeter. 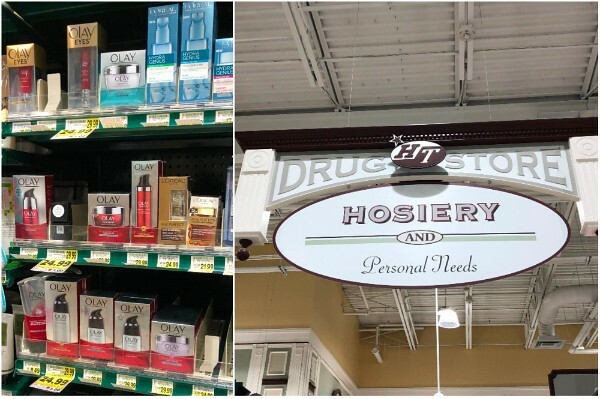 You can find it at a Kroger Store near you. I always forget how much hydration effects my skin until the winter time, when everything feels dry. I'm good about drinking water when I'm hot - but not so much when I'm cold. Thank you for the good reminder! I've been wanting to try this cream! 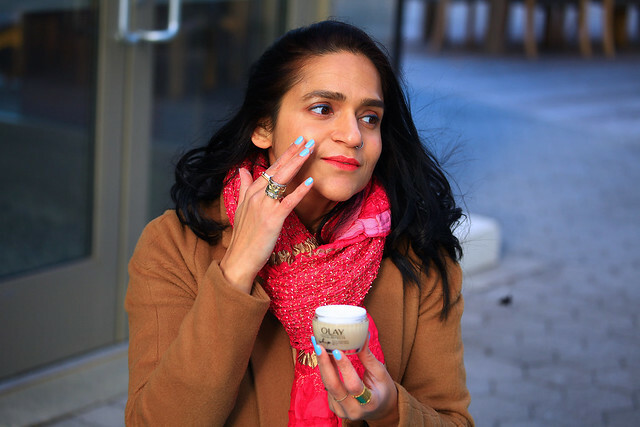 I'm all about finding the best ways to make my winter skin look best - thanks for sharing! That sounds great! So hard to keep the skin hydrated in the winter! I have been wanting to try the Whips! I have dry skin because of the rough winter here in NJ. Definitely going to pick some up! Great tips. I definitely don't drink enough water, but when I do I notice a difference in so many things including skin. Thank you for sharing. I have been using the Olay day cream but the packaging is different from the one you show in the picture. I should give it a try on Olay Total Effects Whip Face Moisturizer. I dont want to get too oily. Lets see. Totally agree with all points! For the most part, I follow all of these tips, although there are times when I don't get enough sleep or enough water. Other times I don't eat as well as I should. I do really love the Olay brand, and this Whip packaging as well. I love Olay! It definitely helped my skin infinitely once I pinpointed my skin type, and bought products to match the skin type! I've heard so many great things about the Olay Whips but I still haven't tried it yet! I need to get better about sleeping more! I definitely need as much help with my skin as I can get. As many times as I've said I'll try Olay, I never have. So I'll definitely need to pick up a few of their products soon! I have oily skin and often have a hard time finding products that keep away the shine. On the other hand, my son has dry skin and I have to find products to keep is skin moist so it doesn't get chapped. I am constantly experimenting with products including Olay brands. Finding a product that you trust is so important. For me one of the biggest factors is finding one that is gluten free. I will have to check Olay out! I love olay products!! Your skin looks amazing!! I've used the Olay Regenerist moisturizer in the past and really liked it- I've great things about the Whip formulation! These are great tips! 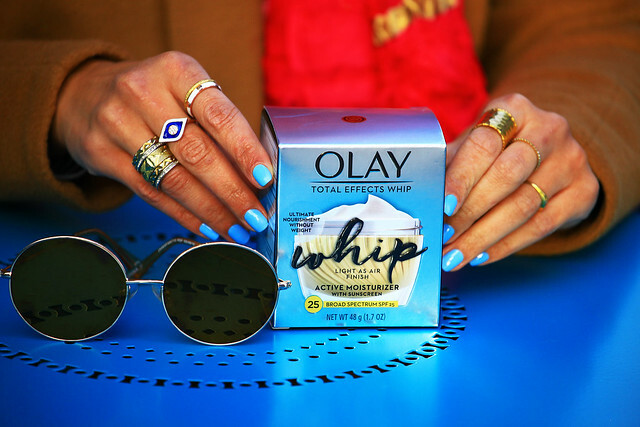 I love Olay products and the whip is my new favorite. Hydration is so important especially in the drier winter months. One of the things I'm worst at is getting enough sleep, bizarre since I regret not sleeping earlier every day! Thanks for your review of this product, it looks like Olay have revamped their packaging for this cream! Such great tips! I'm the worst at drinking water and keeping hydrated! Great tips!. I need to get more hydration! Winter in Colorado...I need all the moisture and skin pampering I can get. I couldn't agree more - a good skin care regime, a healthy diet, exercise and restful sleep all help towards achieving healthy skin. Havent tried the whip version, but Olay has been my choice of moisturizer for ages now! Good sleep is the one thing I struggle most with and notice a huge difference when I sleep well, vs when I dont. We don't have winter I am it's almost sunny every day but good skin care is still important. Olay is one of my favourite brands. Thanks for the information. These are all amazing tips! I really am trying to change my sleep habits because I can tell my skin is not so great right now. Having glowing skin all year round is certainly a dream to me. I do use moisturizer but I have not tried Olay yet, though I have heard lot about this brand. Now seeing your post I want to give it try to see its effect on my skin. Ooh I am eager to try this out, my skin is just awful lately, I eat healthy, work out, drink water.. It's like my teenage years multiplied and came back to attack me. I like that this is light weight but still offers much more than a regular moisturiser, I am going to look into this one! I am always so dry in the winter. My skin looks much better when I take care of it, but I always forget. yess to sleep and hydration! it makes such a huge impact on my skin. Olay is such a go-to brand for me, they never fail to give what they promote. I havent seen this whip product yet though but it looks really good. I loved your tips for healthy skin too I learned a lot! Hydration is a must especially during the winter months when everything dehydrates. I love these products and they always help in the dry seasons. These are all excellent tips! I agree with everything you said, and our skin definitely shows our lifestyle! I believe in hydrating inside-out, but I can't drink 4 gallons per day! Great tips, I drink lot of water and try my best to keep hydrated but with Michigan weather I still get dry skin. Good, sensible advice here. I would also recommend using ice on your skin every so often - it freshens the face, cuts down on the ruddiness as well as closes the open pores. Result - great, younger looking skin! I love the look of that 'whip' product! It looks so light! I really need to work on my skin routine! I've gotten a few products recently that help, it's just been neglected for so long!! Thanks for the tips! You provided some very sound advice for keeping up with your skin. I must admit, that is something that I need to work on. Keeping up with diet, exercise, sleep, and water intake....a struggle. These are great tips/reminders. I drink water often throughout the day and use moisturizer. In the winter, I have to use extra products to help with hydration. Skin care during the winter can be a challenge. I'm looking for a new face serum that will hopefully help. Looks like a great product for hydration. I can't believe I haven't tried this Whip product yet because I've been hearing such good things about it all over the place! Def picking it up on my next Walgreens or Target run! I've got to try this! My skin gets so dry in the winter! PS love your nail polish! webpage's content everyday along with a cup of coffee.